One of the things iOS users have to put up with is the lack of an expansion card slot in their devices. Apple’s done it that way since they started and there’s no reason for them to stop. 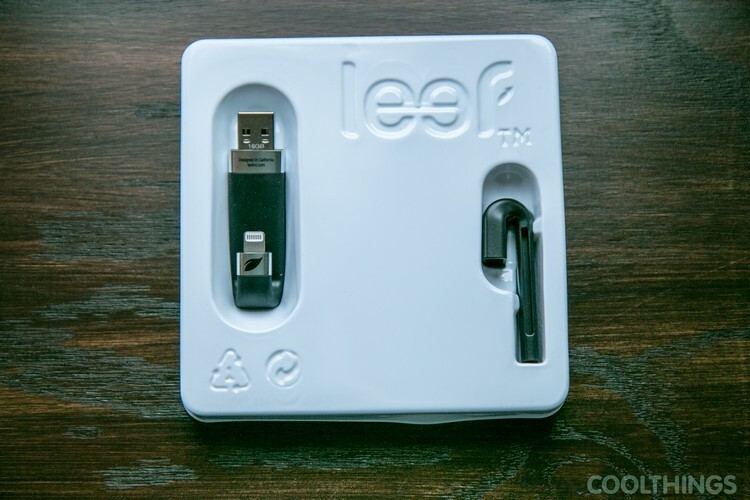 While iCloud and other cloud services give users an alternative, those who want local storage for the glut of media they intend to carry around should be better served by products like the Leef iBridge. We recently picked up one of the entry-level 16GB models and, I have to say, we’re impressed. 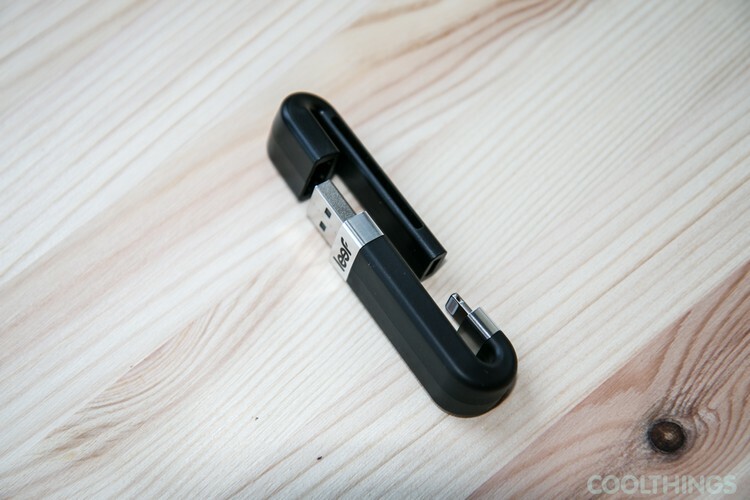 The iBridge sports a curved J-shaped design, with a Lightning connector on the short end and a USB plug on the other. 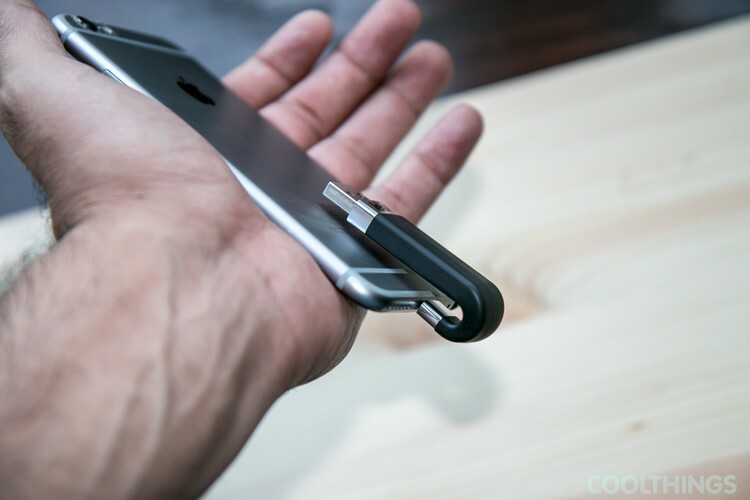 It might be an awkward-looking design at first that surprisingly works well, since it moves what could have been a long, unruly dongle out to the back, where it’s able to sit flush against the back of the phone. 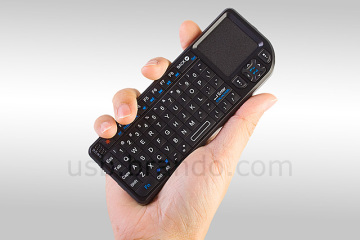 As such, you can use the phone or tablet without much adjustment, holding it in whatever way you find most comfortable. 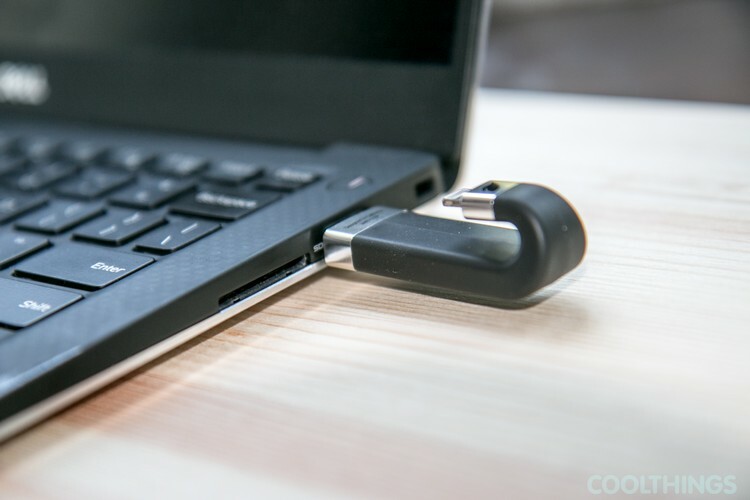 Since the device has a good amount of flexibility along the curve, it can be opened wider to accommodate even thicker cases, so there’s no need to remove them in order to use the additional storage. 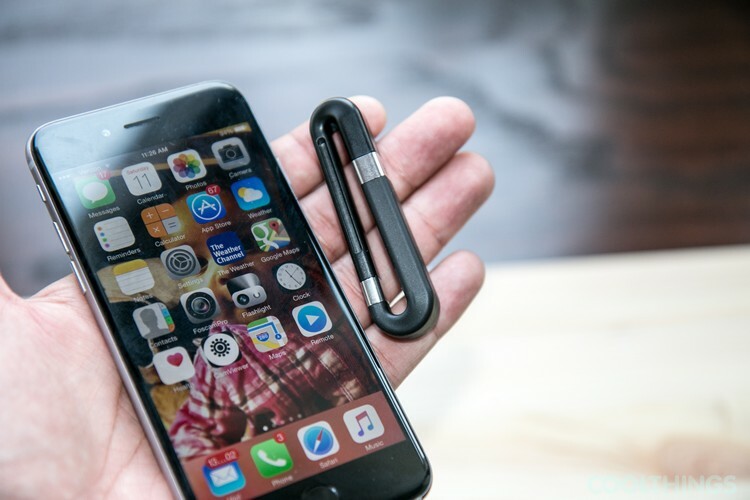 It comes with a similarly-curved cap that’s designed to cover both plugs, turning the assembly into an oval shape that you could hang on a bag loop or a carabiner to minimize the chances of dropping it when you’re on the move. 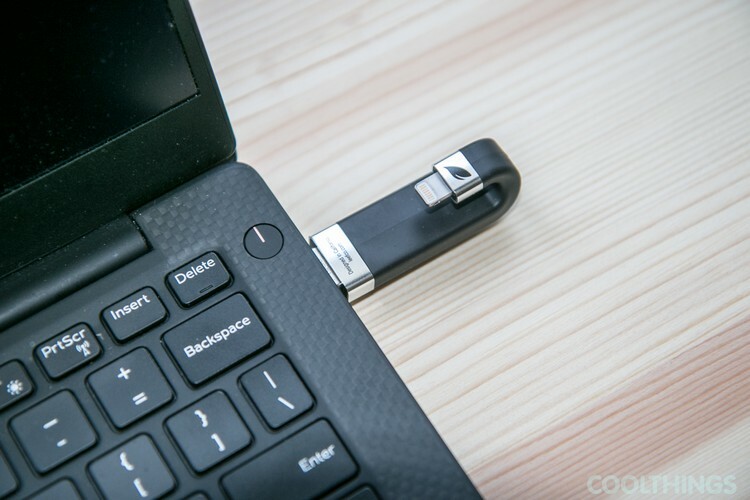 When plugged into a Mac or a PC, it functions much like any other USB 2.0 thumb drive. 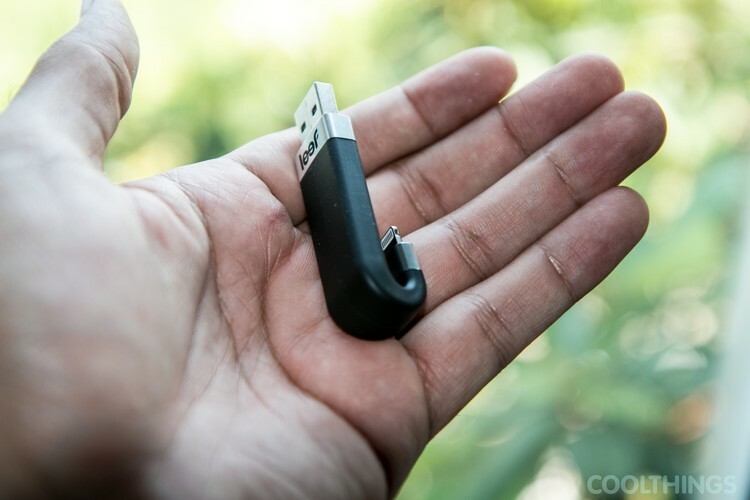 You can access it in the file manager, copying and pasting content the way you would with any other USB storage. Do note, the shape of the iBridge makes it especially cumbersome (in many cases, physically impossible) to plug it both to a computer and an iPhone at the same time, so it’s not designed for use in that manner. 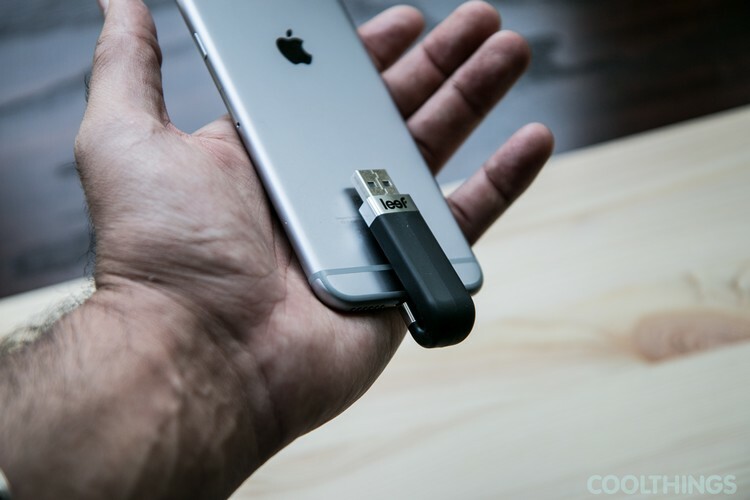 As soon as the device is plugged into an iPhone or iPad, it launches the iBridge app, which serves as your interface for interacting with the external storage. 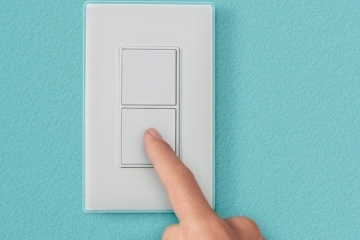 It presents the users with four options: Transfer Files, Content Viewer, Camera, and Settings. Transfer Files is the file manager section of the app, allowing you to browse and manage files and folders, as well as transfer them from the iBridge to the iPhone/iPad storage and vice versa. It works fast, with a layout that should be familiar to most anyone who’s used a file manager in the past. Content Viewer lets you watch movies, listen to audio, read documents, and view pictures saved on the iBridge without leaving the app, saving you from having to transfer files into the native storage. Files are grouped according to type in this view (e.g. songs will be sorted by title, artist, album, and so on), with no folder view available, so you can end up doing lots of scrolling if you have plenty of the same file type saved. It can handle a good amount of formats, with an option to launch the file in a different app when it isn’t supported or if you prefer a separate app for consuming a particular content. 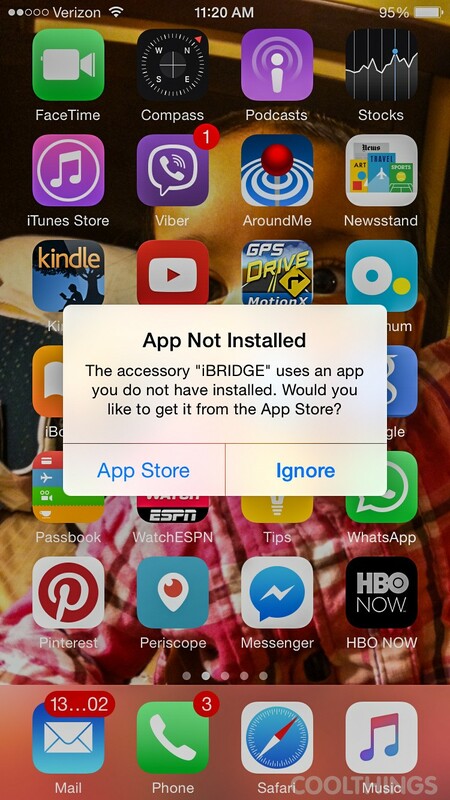 Chances are, users will end up using the iBridge a lot for precisely this feature. 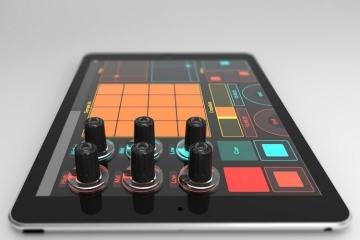 It’s an especially convenient way of watching large videos on the iPad, as you can simply copy them off a computer, plug in to your tablet, and start enjoying the show. Same with accessing a collection of books, music, or documents in your computer, especially if you get your content any place other than the iTunes store. 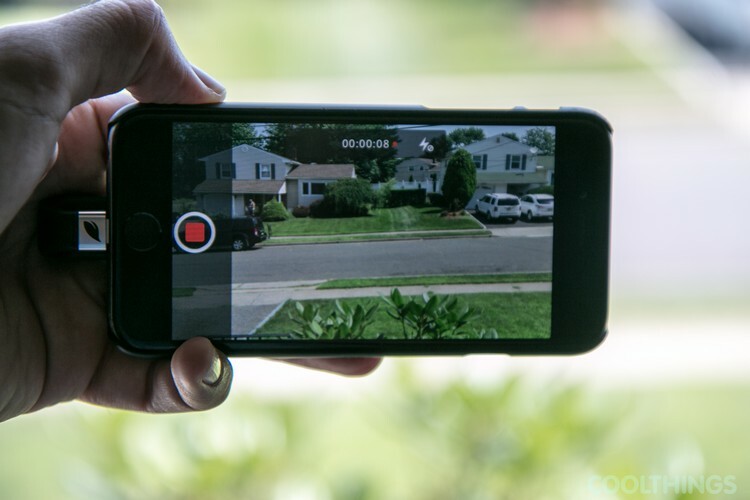 Camera is, basically, a camera app that you use to shoot images using the iPhone/iPad’s camera, all of which are saved directly to the iBridge. It doesn’t have as many detailed controls as some of the more popular camera apps, so if you can’t live with those, you can simply set iBridge to automatically backup all iOS images onto the drive whenever it’s plugged in as an alternative. Aside from backing up the iOS Camera Roll, iBridge can also automatically back up your contacts list and easily restore them later. 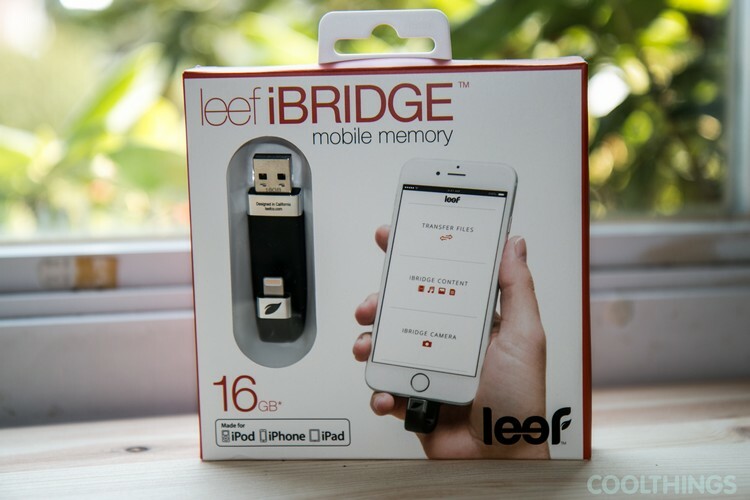 A smaller, 16GB iBridge like the one we have will be useful for watching a couple of videos you have saved without having to go through the hassle of iTunes. 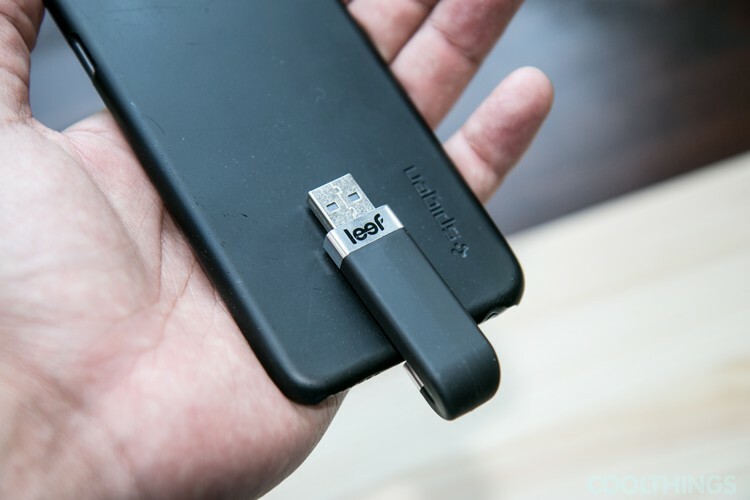 For those who use the iPhone for filming, though, one of the larger capacities (32GB, 64GB, 128GB, and $256 are all available) should be a more suitable option, especially when you don’t want to drain your batteries with a live data connection so you can back up to the cloud. Same goes for those who’d like to carry a collection of content that you can access at any time, whether it be movies, music, ebooks, or something else. 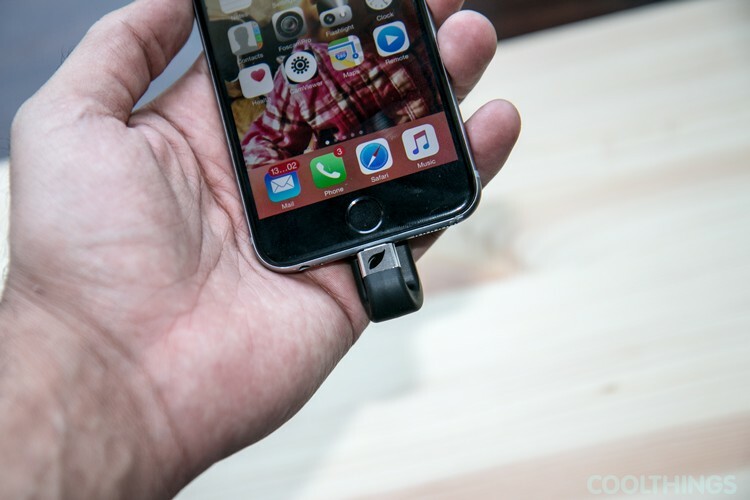 While it’s hard to expect the iBridge camera app to be as feature-packed as dedicated ones, it’s still very useful and lets you store directly instead of having to back up from the Camera Roll. 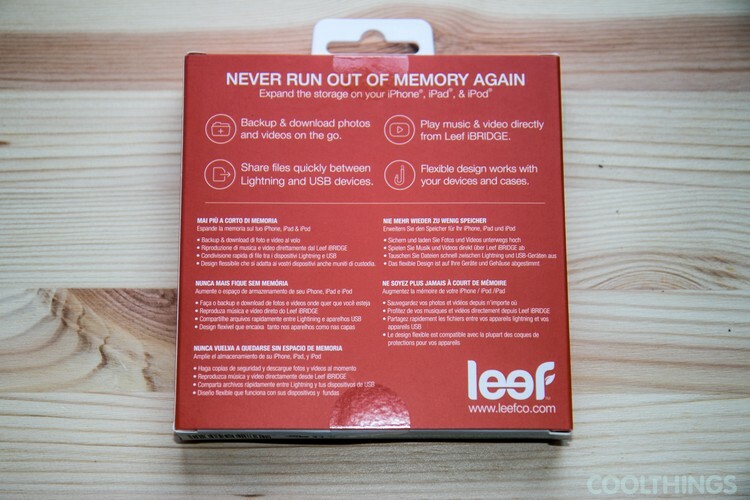 We saw no issues with recording HD video directly onto the Leef either. Imagine spending a weekend off the grid in a beautiful lake, filming the surroundings, and finding out you’ve nearly exhausted your 64GB iPhone’s available storage – having a direct-to-iBridge video recording capability, literally, saves the day. 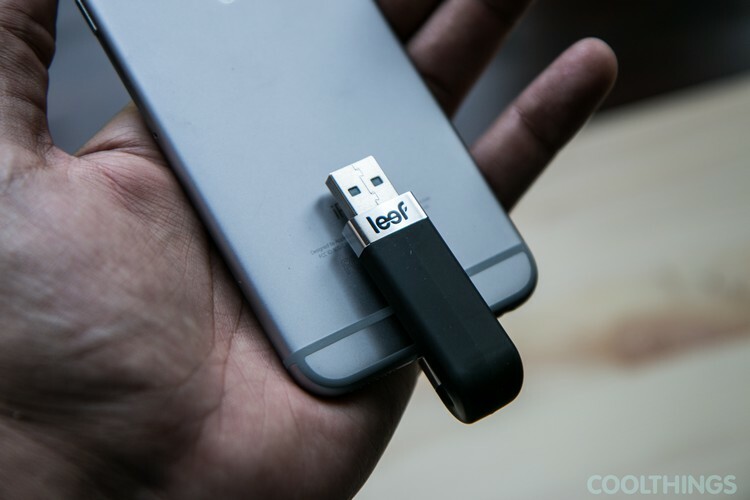 The Leef iBridge isn’t the cheapest external storage solution for iOS devices. 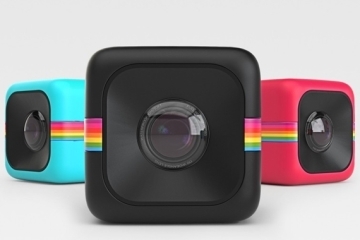 However, the unique design and the perks that go with that sure feels worth a few dollars of difference in price. Plus, it should be cheaper than upgrading to a higher-capacity iPhone. It starts at $59 for the 16GB and tops out at $399 for the 256GB model. $60 for 16GB for technology like this is a steal! This is really sweet, and I have occasionally seen similar technology being used on laptops around the coffee shops. I like how flexible and durable it is, and it’s a nice small fit. I think that the wrap around design is a little awkward, but it beats a full size cord! I really like this, and the fact that you don’t have to use it’s camera app is helpful, because just like with other apps and data I would only want to use a ‘flash drive’ like this simply for baking up information and moving it around. 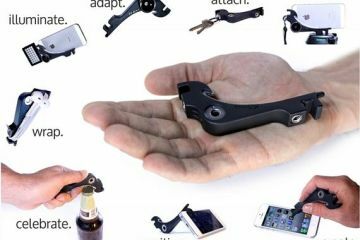 The keychain clamp look style is awesome, and it seems like it would be sturdy enough to hook on to your keychain when you aren’t using, so nice! Also, that means it wouldn’t have to be connected all the time, so that’s a good deal.